Sometimes I wonder what I’m doing. I’m all about the design – and that is my main focus. Trivial matters like gravity are of little importance. 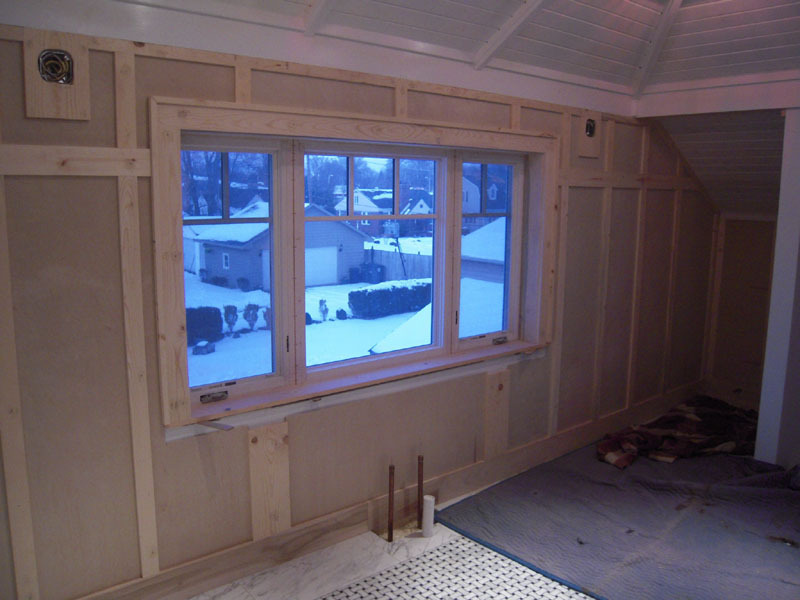 I did have a little forethought to have the tub put through the window when I was replacing all the windows. Notice this is pre two room additions. 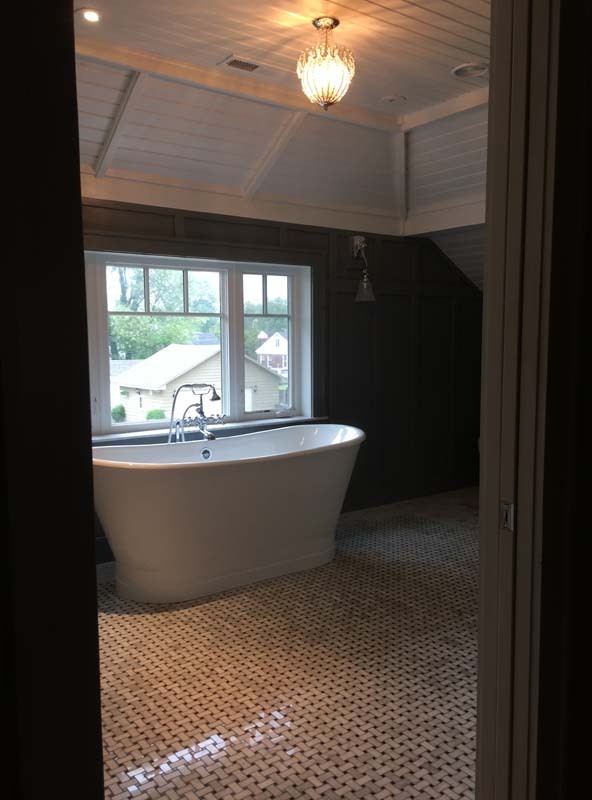 Of course, that was several years ago and the tub has been sitting upstairs for four – that’s right, four years waiting for a place to call home. So there’s the tub. I’ve cleaned up 4 years of dust and dirt and cut and installed the drain and over flow pipes. I had built a rolling cradle for the tub so that I could move it around upstairs while I ran new HVAC pipes and other structural projects. And here’s the target. All I have to do is get the tub off the cradle and over here. Simple enough, except the thing weighs 324 pounds and sits about a foot off the floor. I could have opted for a light and nimble acrylic tub, but no, the design thing called for something, well – heavier. My wife knowing I was scheming to somehow get the thing in there by myself, called a moving company and yesterday morning 3 guys showed up to help. And it took all 4 of us to maneuver this awkward object into place. Once we got close I wrapped the drain tailpiece with heavy duty Teflon tape and added a little pipe dope for good measure. I don’t want to do this part again. And finally it’s in place – hopefully for a very long time. It’s one of those French Skirted Bateau (Boat) bathtubs. I got this from Signature Hardware – actually I got two of them. The first one had a dent in the skirt, so they sent a replacement – no problem. I even took my wife to their showroom near Cincinnati so she could sit in the tub and make sure it wasn’t too big or uncomfortable. 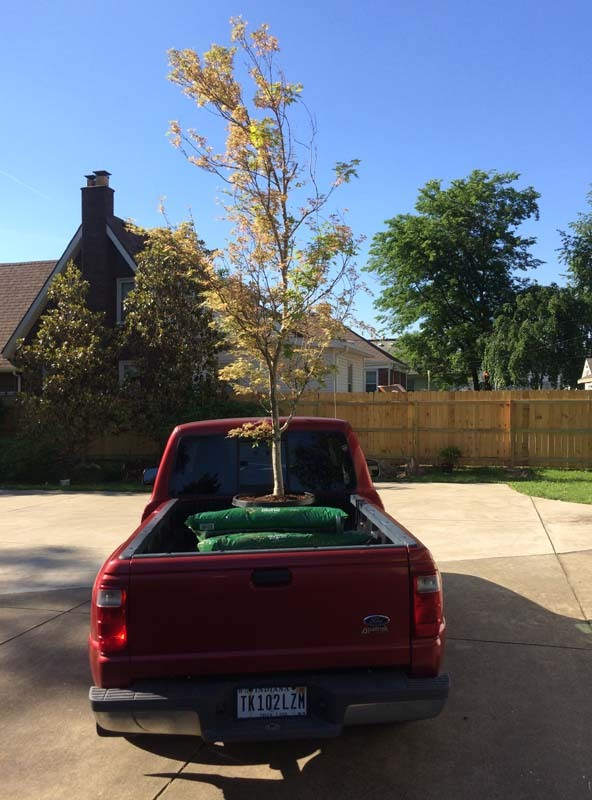 I say I’m obsessive – my wife thinks I’m crazy. The plumbing shows more than I imagined, so I’m glad my motorcycle parts are shiny to look at when I’m sitting on the toilet. The faucet is a traditional one with a knob for a hand shower – it’s the same one I have in the first floor bathroom. I’m not sure about the style – but it works. The tub drain is a toe tap, so it makes the plumbing pretty simple. Now I have to find a rustic chandelier and put on the air vents and move on for now. 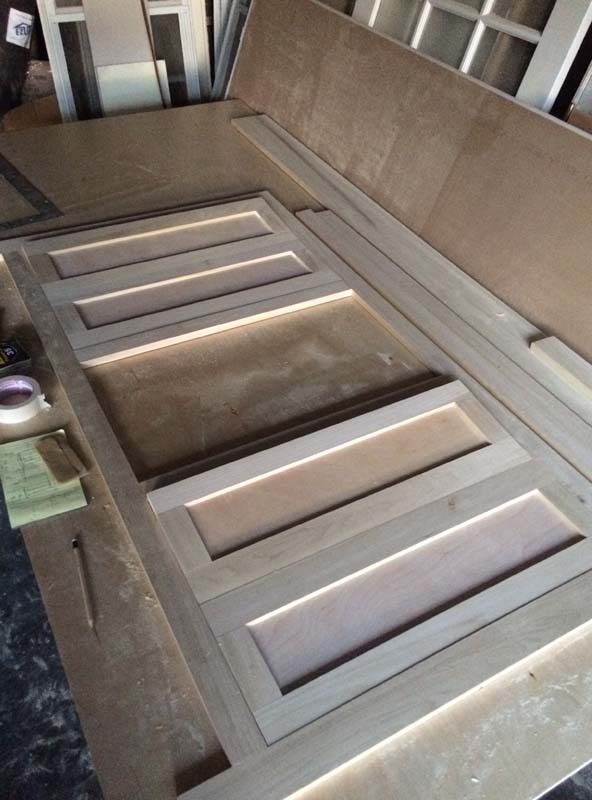 The vanity cabinets won’t be built until the kitchen goes in. 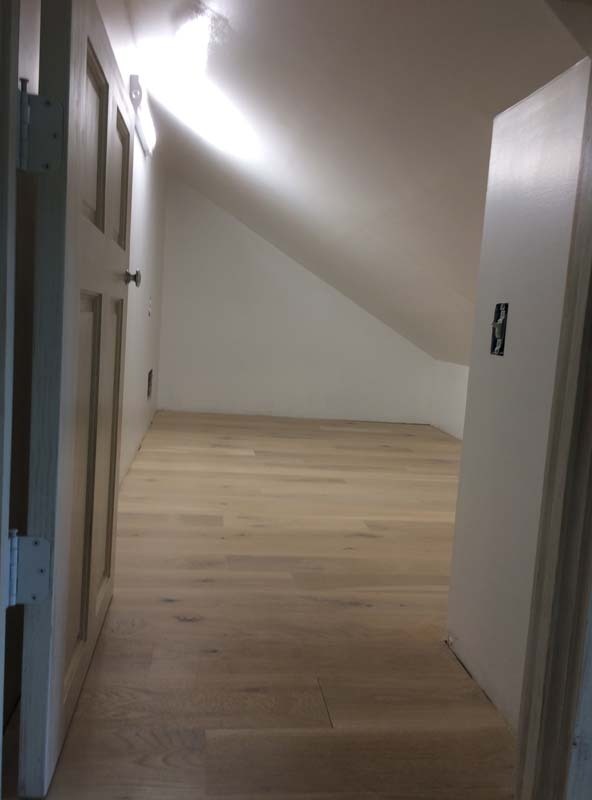 So we’ll pop down to the basement and make some stairs. Looks like more sawdust. Grab your dust mask and tag along. The blog post has been pretty quiet around the Misadventures project – not because of lack of activity, but because it’s still not to the pretty stages yet. 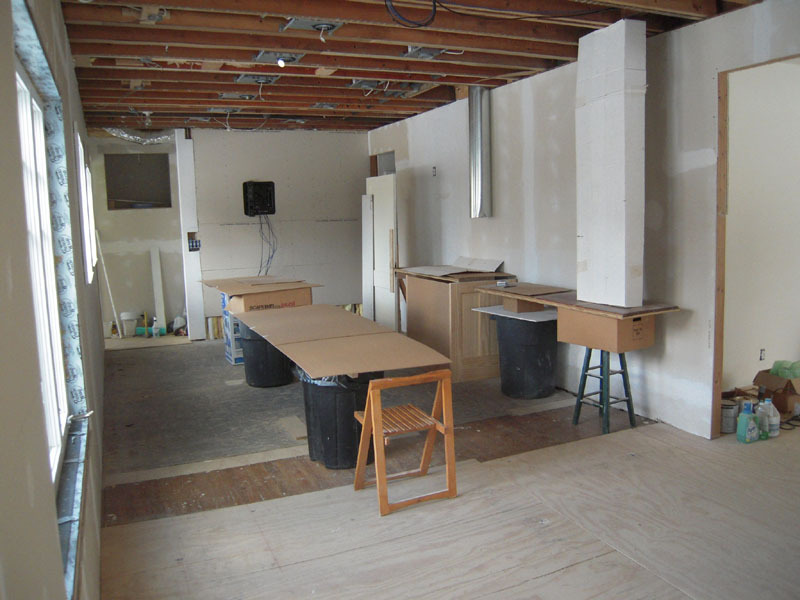 I have projects in the basement, 1st floor and second floor too – hence the blog title. 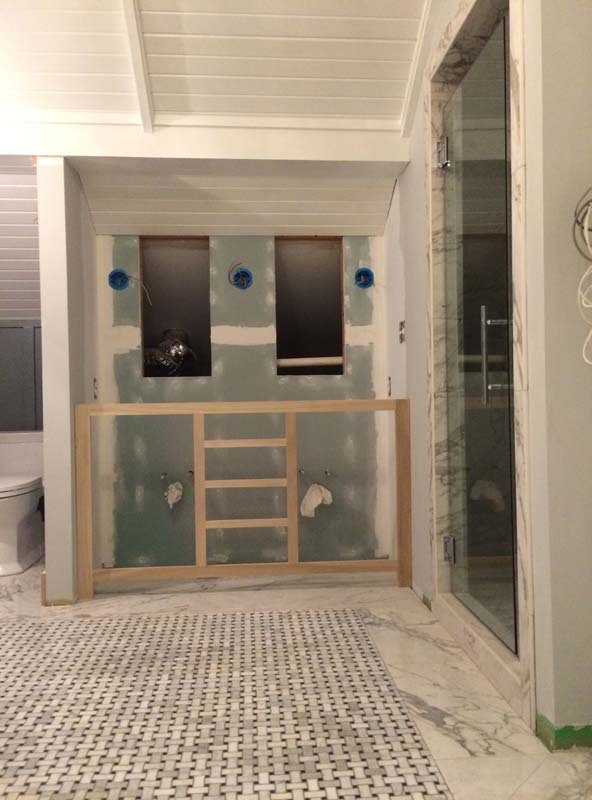 The steam shower framing is done. 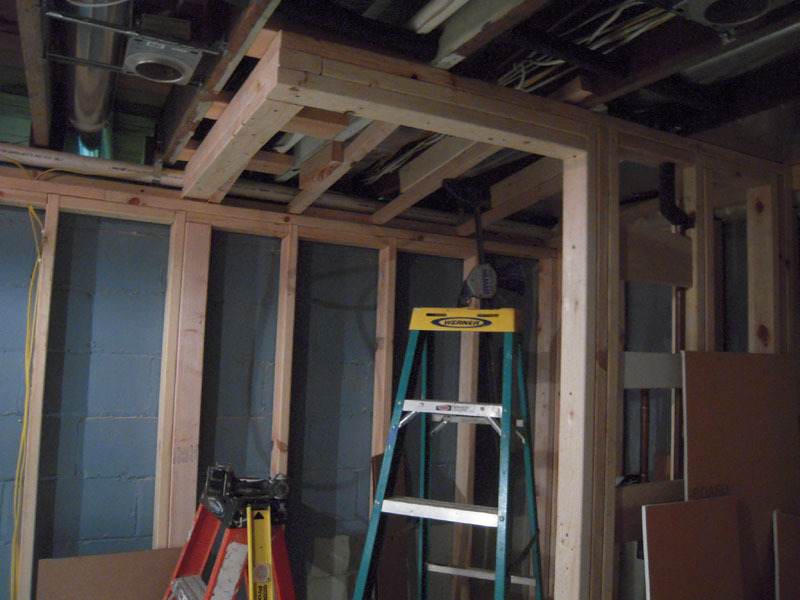 The sloped ceiling is framed and all the plumbing is in. 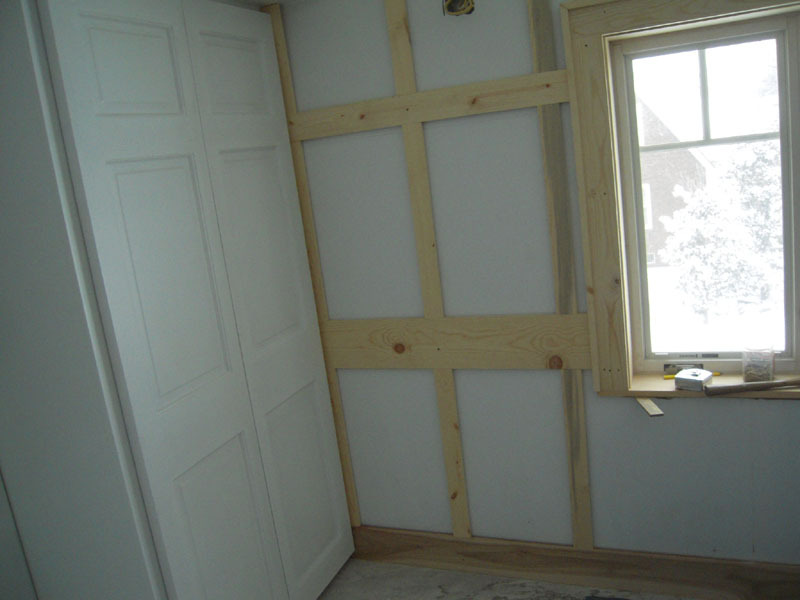 All this has to be finished before the walls get spray foam. Of course to make it more complicated and expensive I’ve run Cat5e and coax everywhere. 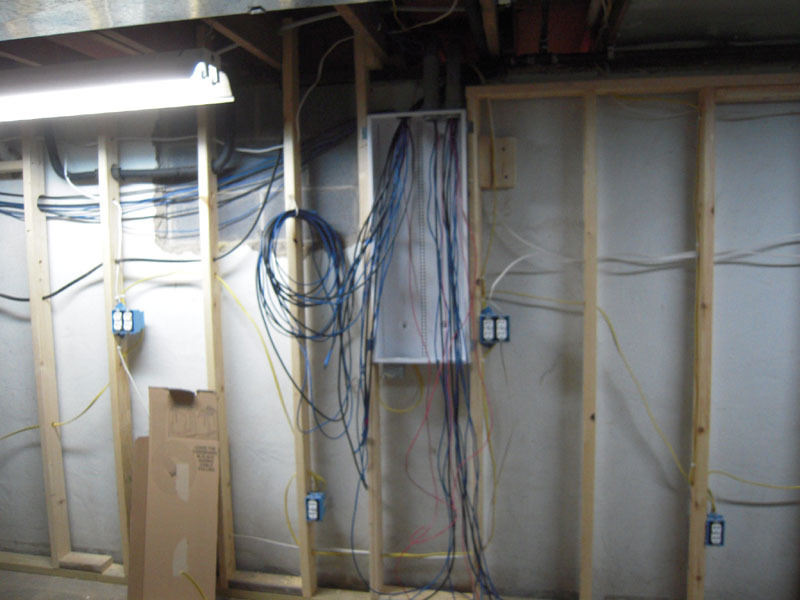 It home-runs back to this structured wire cabinet in the basement. 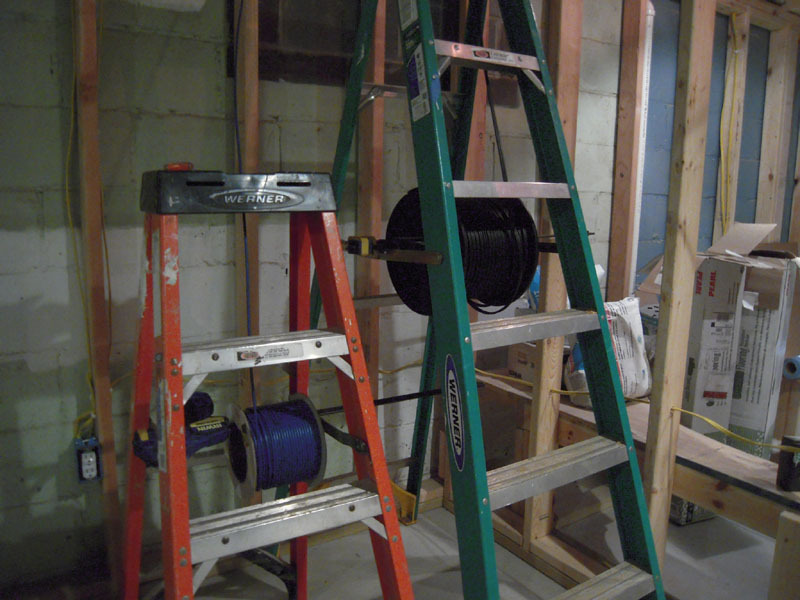 I use ladders and bar clamps to hold the wire spools while I pull the wires from one floor to the next. Some are in conduits and some are not. Extra lines are run for stuff I didn’t think about. In the kitchen I’m finally getting around to mocking up some layouts. I need to know where to run lighting and speaker controls as well as gas lines and all the other things that go into the kitchen. It’s a modified galley that allows traffic to avoid the cooking area. More on this in later posts. Upstairs I’m laying out the bathroom window wall in my traditional freestyle design technique – lay some sticks against the wall. Good enough. 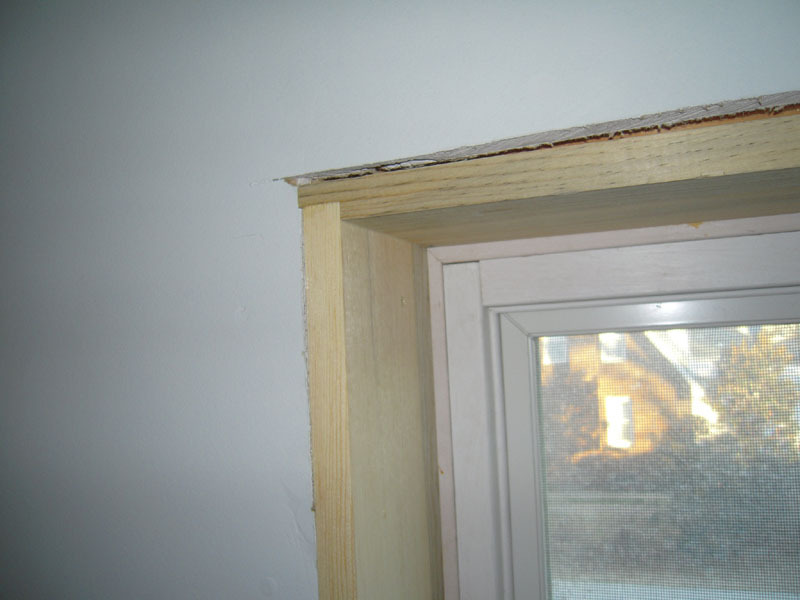 1st the window jambs are made and the corners are routed to make a stronger straighter corner. 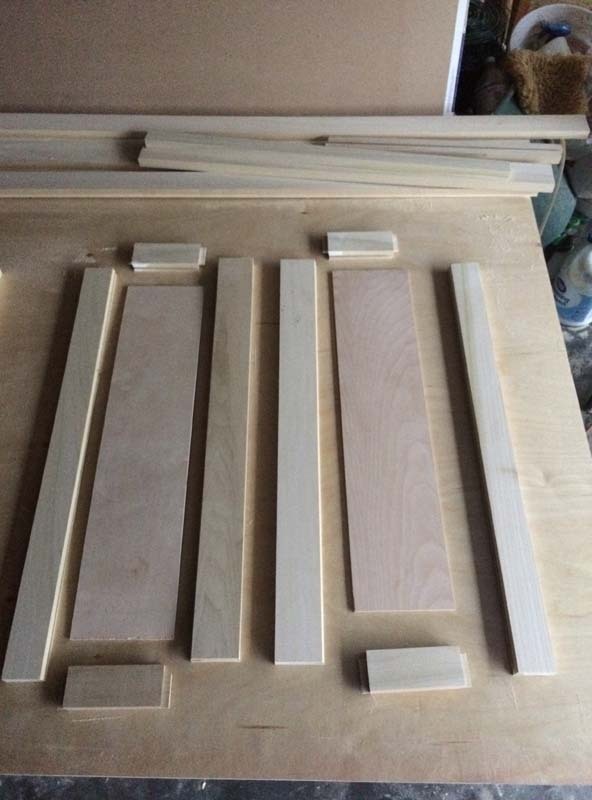 The side casings are added and the top is measured and cut. The ‘U’ shaped casing is glued and pocket screwed together on the back to make a nice tight joint. 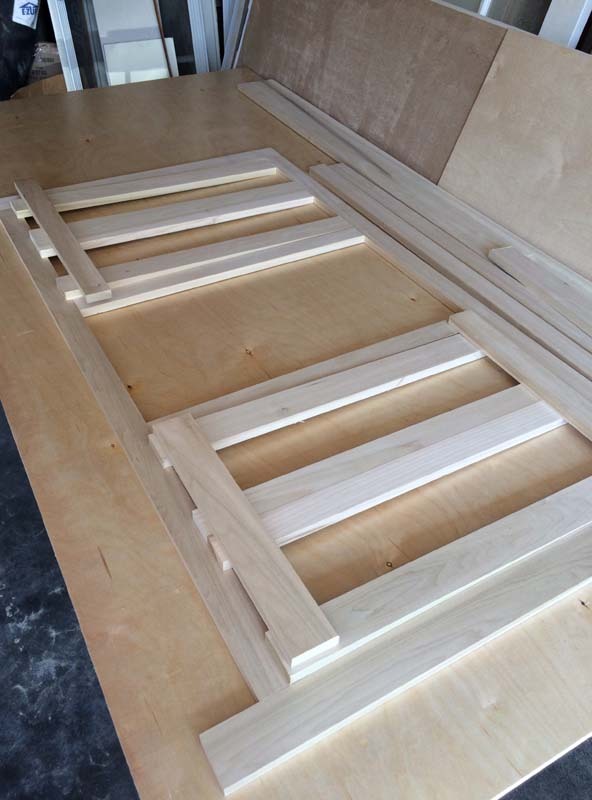 The bottom will have a marble sill. 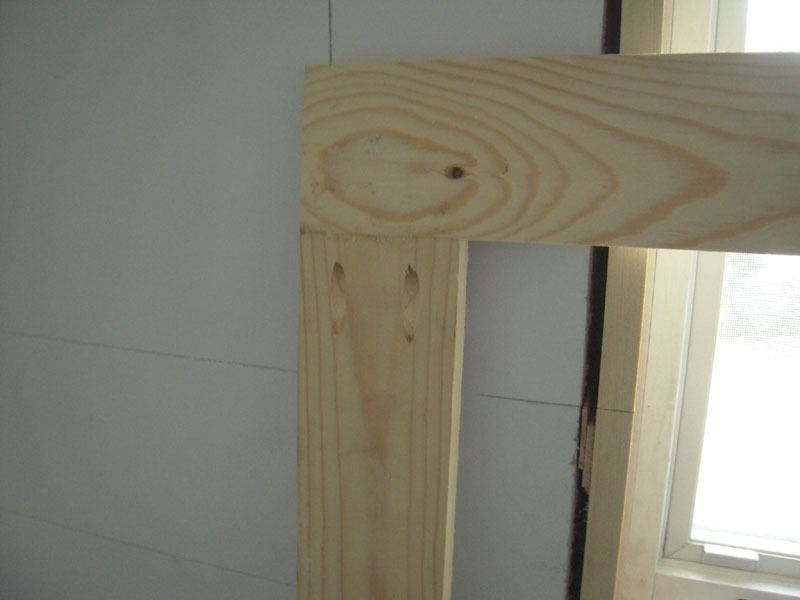 A preliminary fitting is made with 3/4″ pine. I didn’t use poplar here because I want some grain to show through the final finish. My original idea was to continue the banding to mimic the doors. One thinner top band and one thicker lower band. 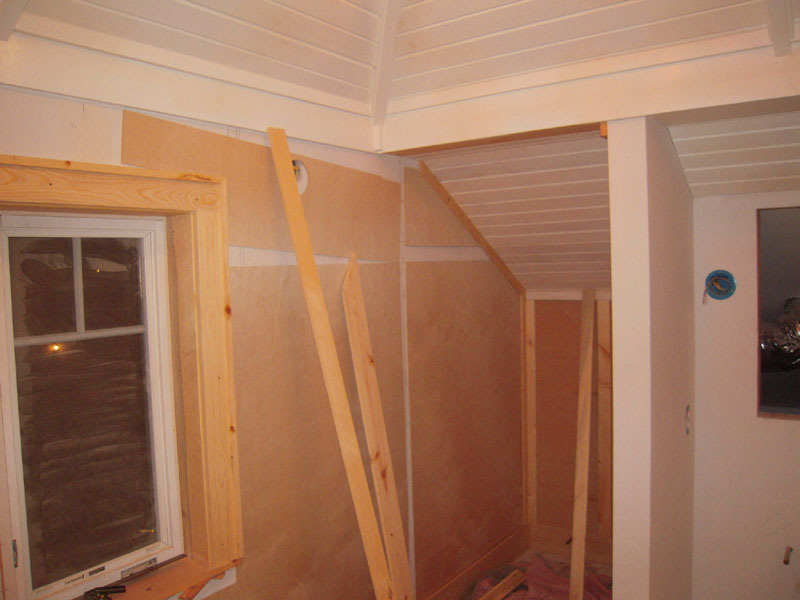 But it made the room look too squatty, so I pitched this idea and the lumber I already cut. Another design faux pas. The wood panels are cut for the field areas. Sometimes people use the drywall as the field, but I want a finish that shows the wood grain, so I used a 1/4″ birch ply panel. 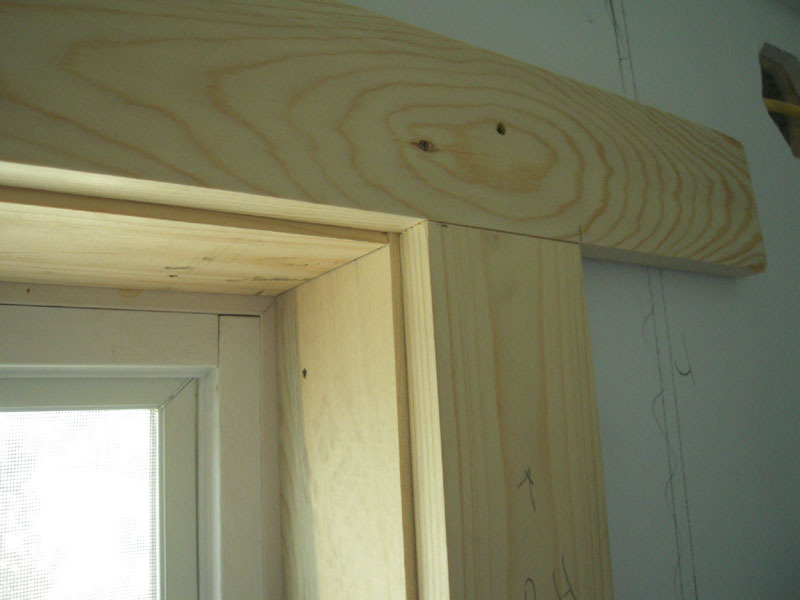 The panel and battens in place. 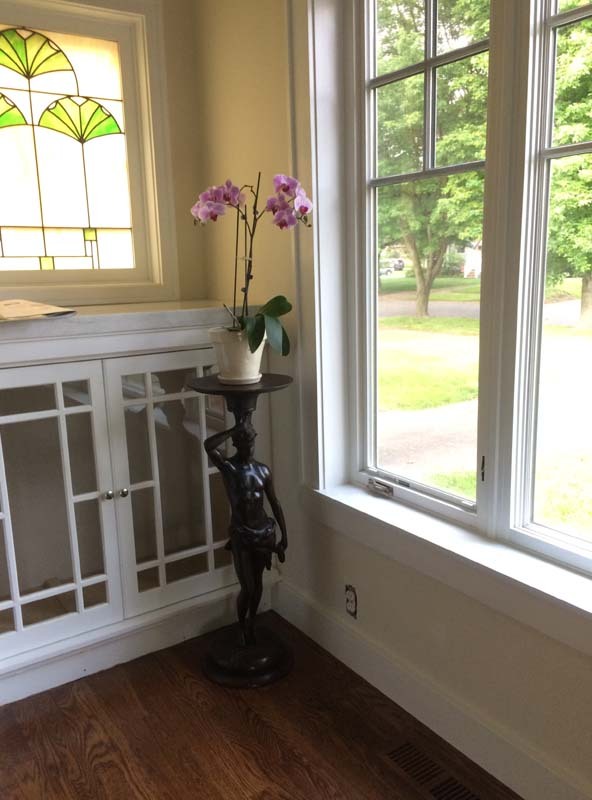 The white tub sits in front of this window so I wanted some contrast in this white room. 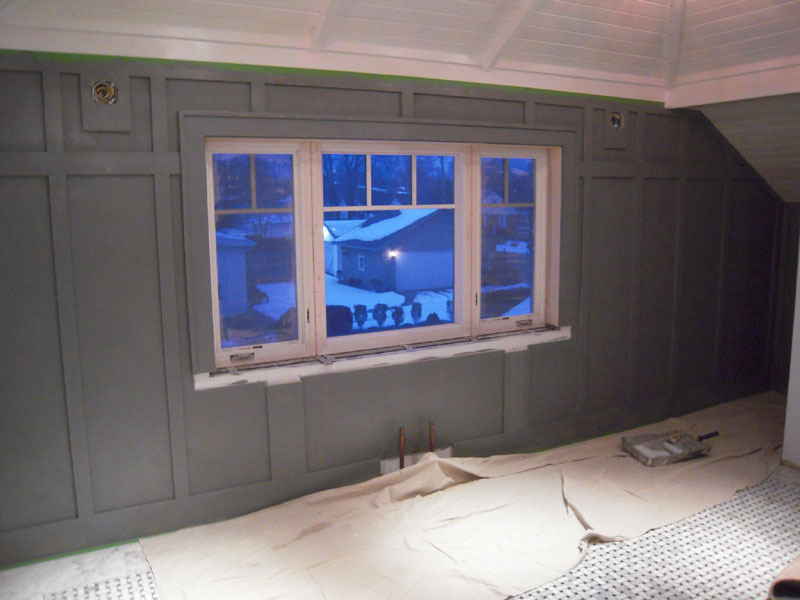 I painted the wall with BM Shaker Gray with a Pearl finish. 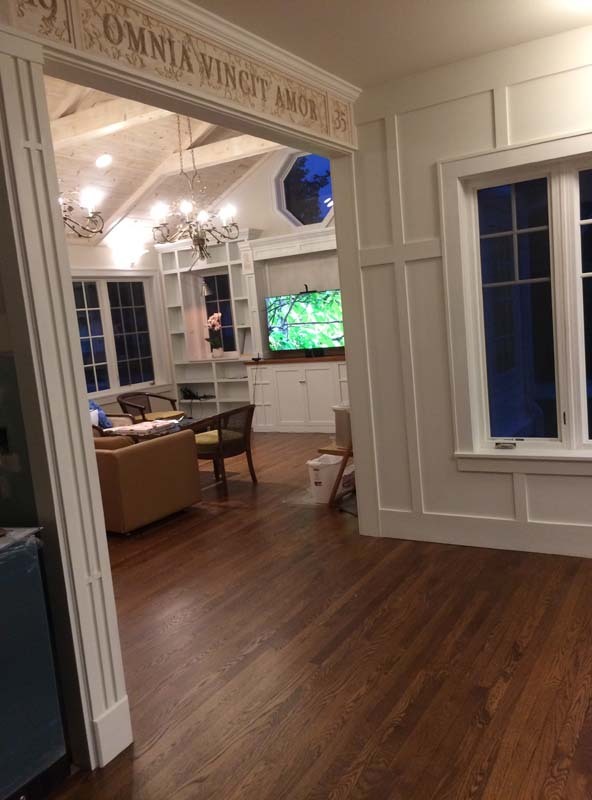 The paint color matched the grey veining in the porcelain tile border. The paint was thinned 5:1 with water and then hand sanded lightly to show some of the grain and texture. The wall was then roller painted with Verathane waterbase satin diamond clear to get a smooth finish with a little sheen. So a little progress on the pretty side, not much, but I promise I’ll get to that in the next few months. Just a quick update and then off to another project to finish the outside before winter sets in. The setters finished up the basket weave floor after several days. Little red spacers are used to keep the pieces aligned. 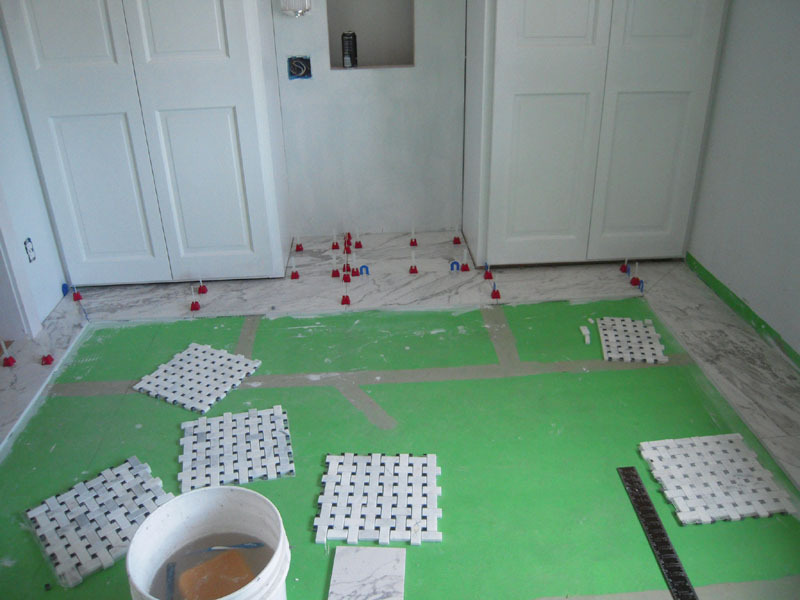 The other red doodads are part of a tile leveling system to keep ‘lippage’ to a minimum. Here’s the ‘hiccup’ part I mentioned in the previous post. 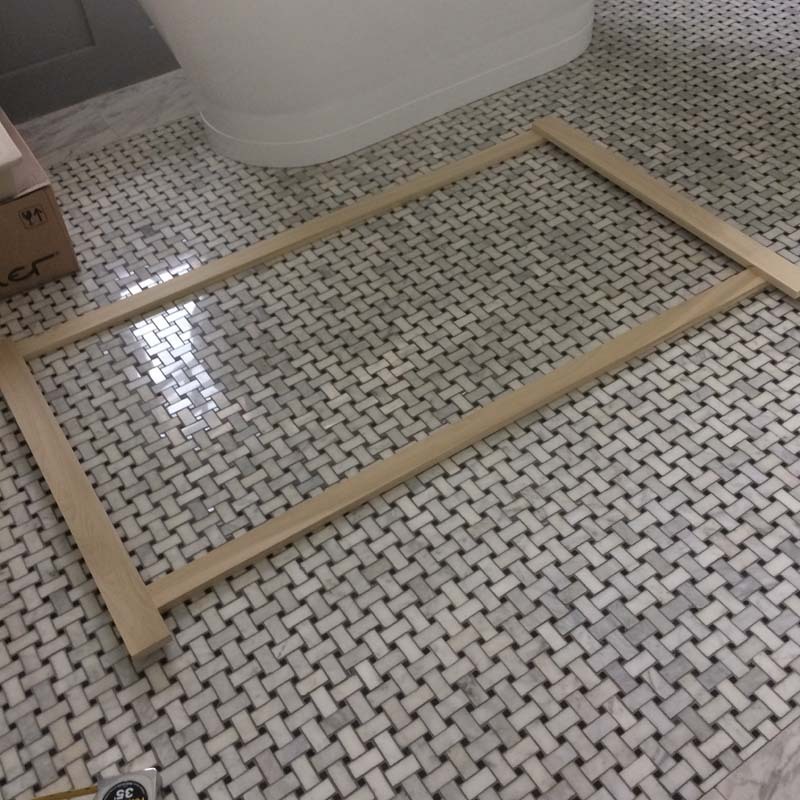 We selected a darker grout for the shower and floor and made a sample to make sure of the color. But when the grout went in it was way too light. 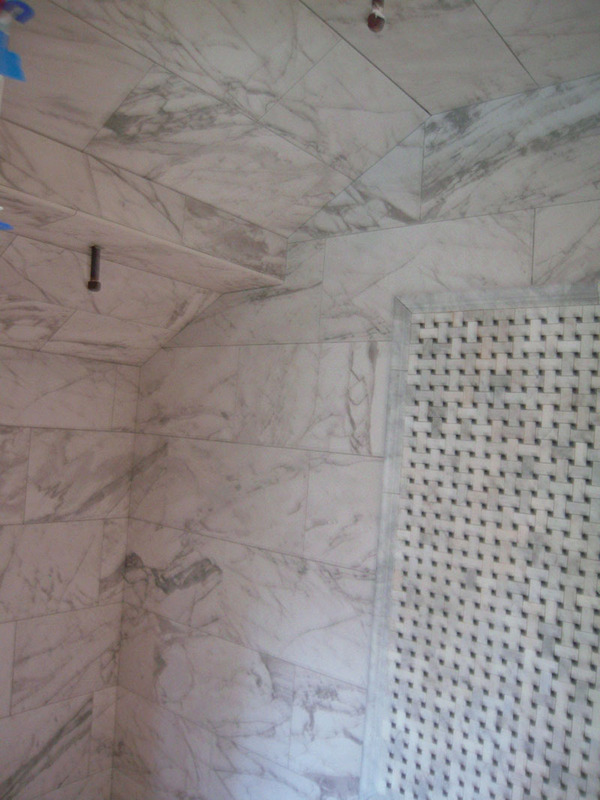 Here’s the insert in the shower grouted. No basket weave pattern. I liked the grout in the shower, but the main floor looked like this too. Little black squares on a white floor was not the effect I was looking for. But this looks cool in the shower. So before anything went in we had the tile guys out to regrout the floor inset. 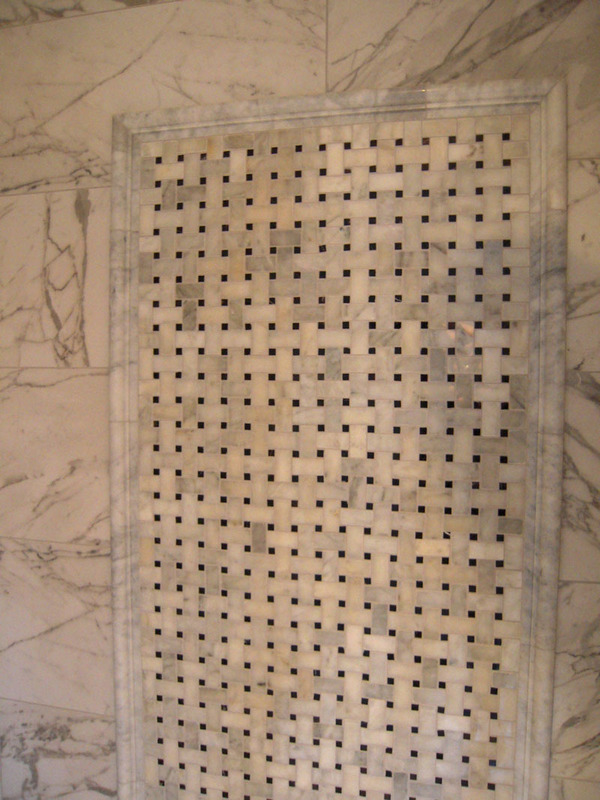 This was epoxy grout and hard as rocks, but the epoxy stain brought up the contrast to get the pattern to show. Now to get the vanity built to go between the cabinets.The bateau tub will go by the window. As well as the sink cabinets and set the toilet. 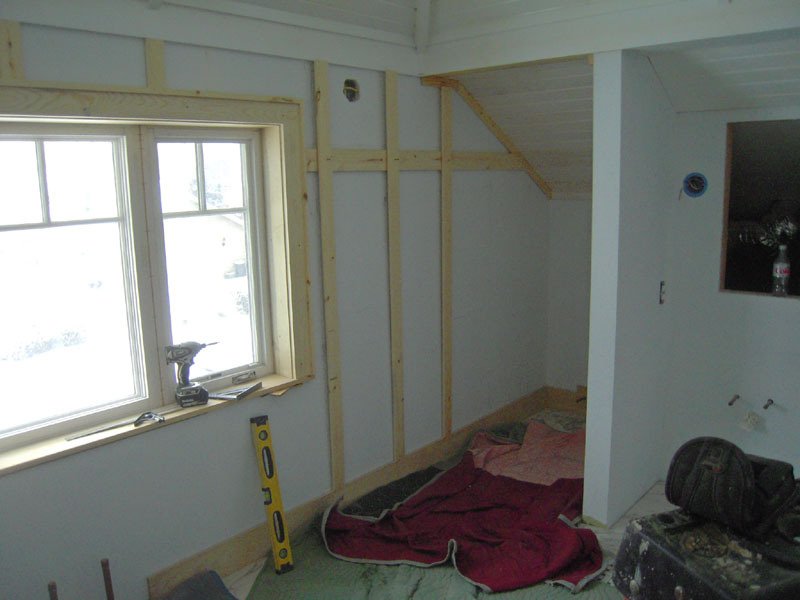 But before that I have an Idea for the window wall – but it’s just an idea right now – subject to change. 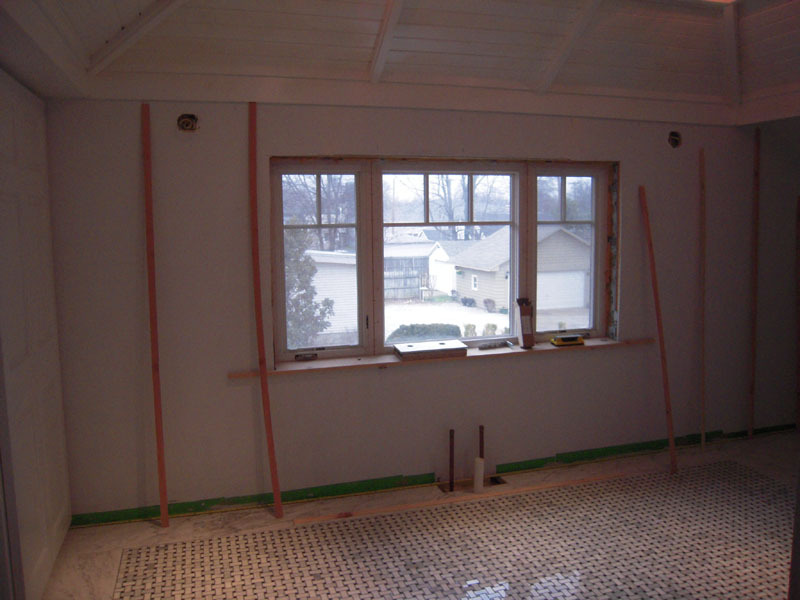 The good thing about the grout stain is it makes the floors look vintage and more in keeping with an 80 year old house. Most of the projects I do look a little ‘too perfect’ and look new. 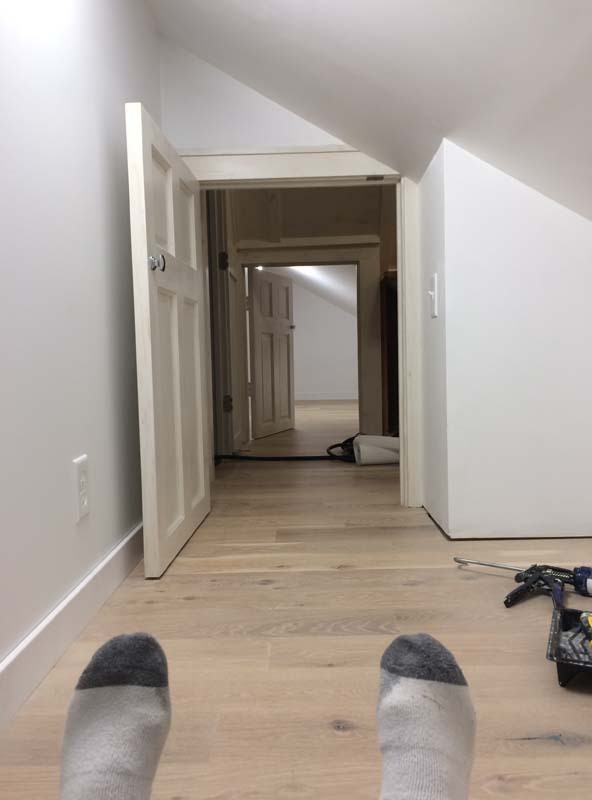 This floor will allow me to set the tone to add more texture and interest to this space, instead of the plain white pallet my wife prefers.I can now do a little more distressing and visual character building. Can you see the professional design side of me coming out here? Sometimes mistakes are a good thing. Well my fellow renovators I’ve finished the outside siding and am waiting for the gutters to be made before I do an exterior round up. So in the mean time I thought I’d start on the Master Bath on the second floor. It’s not done yet – but what else is new? 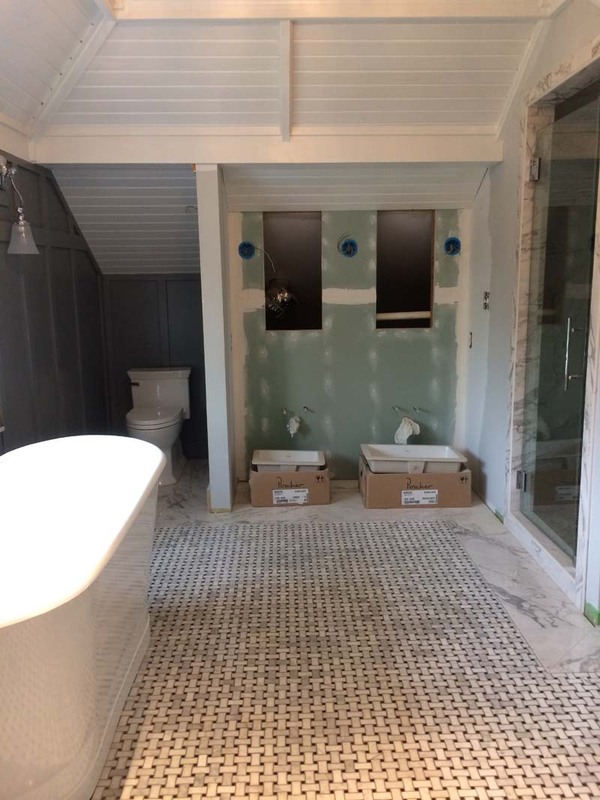 I must say I didn’t do this tile project – even though I bought a fancy tile saw. 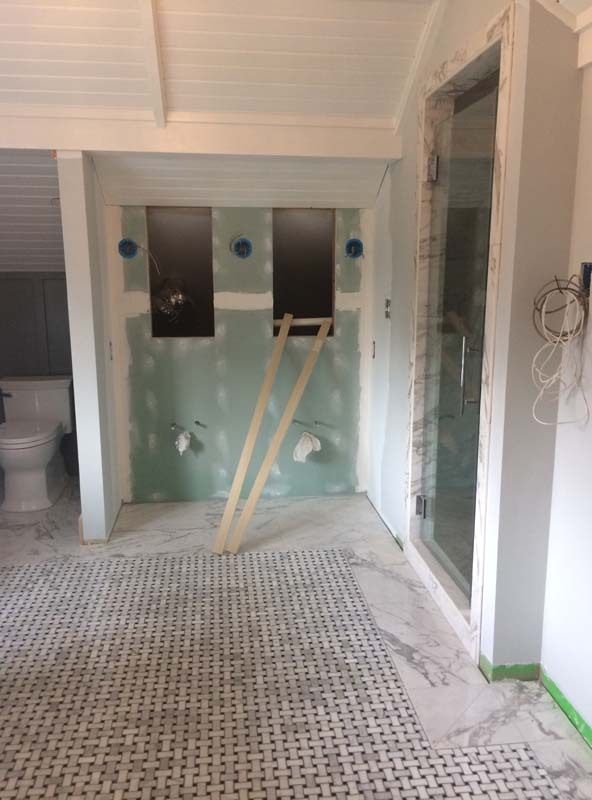 While I was siding the house two guys worked every day for three weeks to put the shower and floor together.These guys were pros – so if I did this you could add a couple months to the time line. 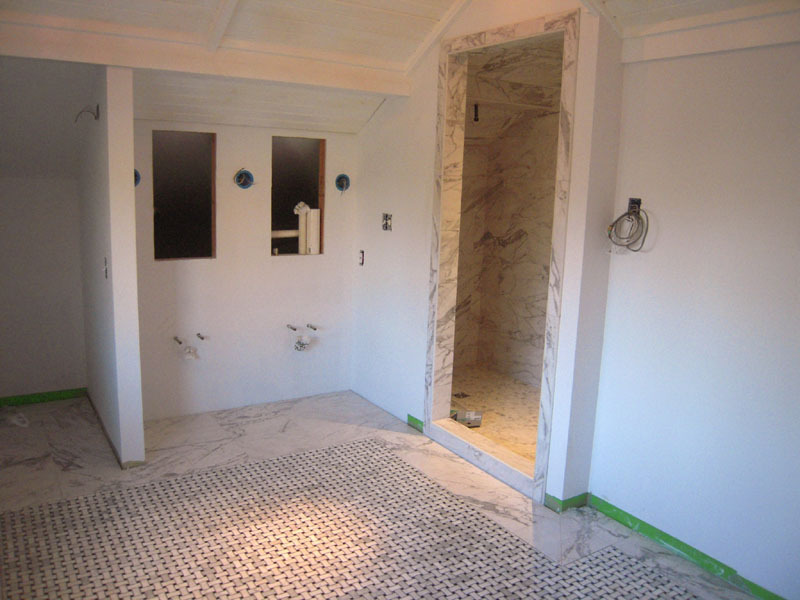 The shower is a 48″ X 72″ space. 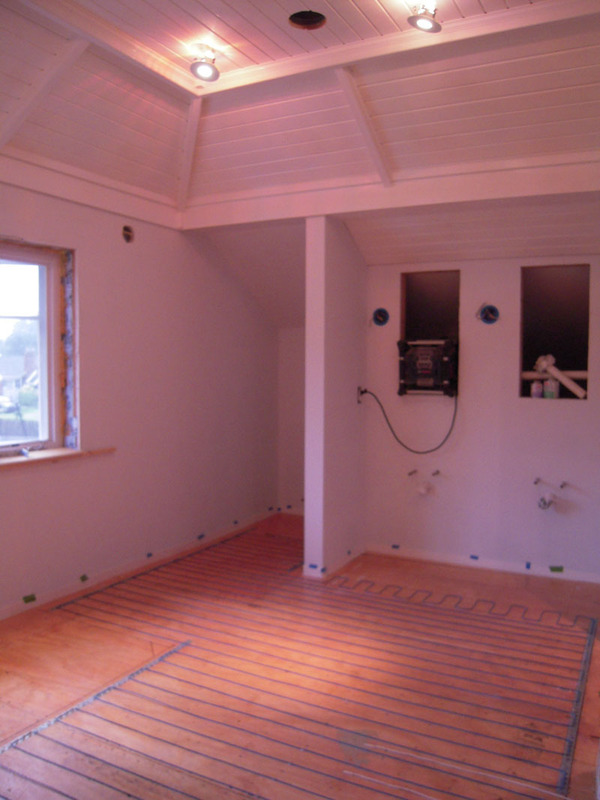 The walls are Kerdi Board and the floor is a traditional mud bed with Kerdi waterproofing. 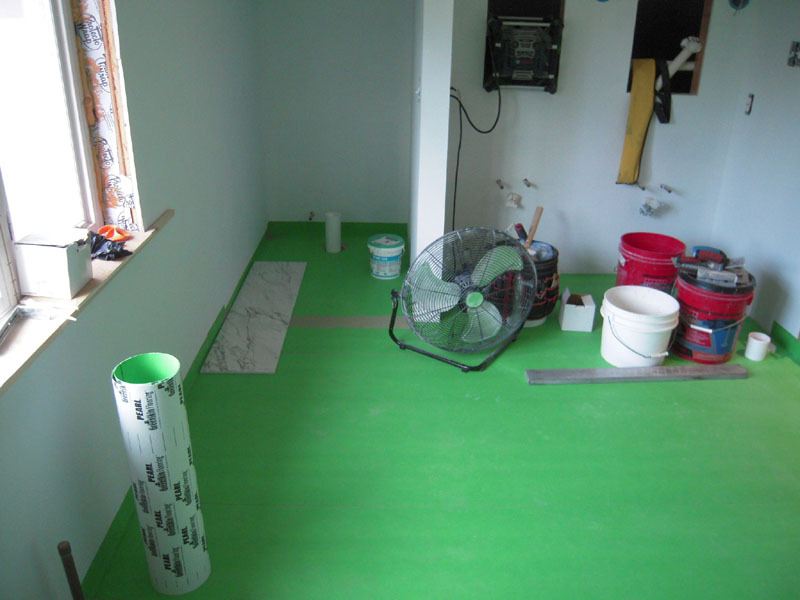 I screwed down another layer of 1/2″CDX plywood over the 3/4″ underlayment before adding a WarmWire in floor heat system. This is my 3rd in floor heat install and I used the wire instead of the mat and it went much better. Before the wires go down the plywood had to be primed for the self leveling concrete that goes over this. The wire heating elements are wrapped around metal cleats that are nailed to the floor. The wires can’t go under cabinets or tub or toilets, so proper spacing away from these is important. 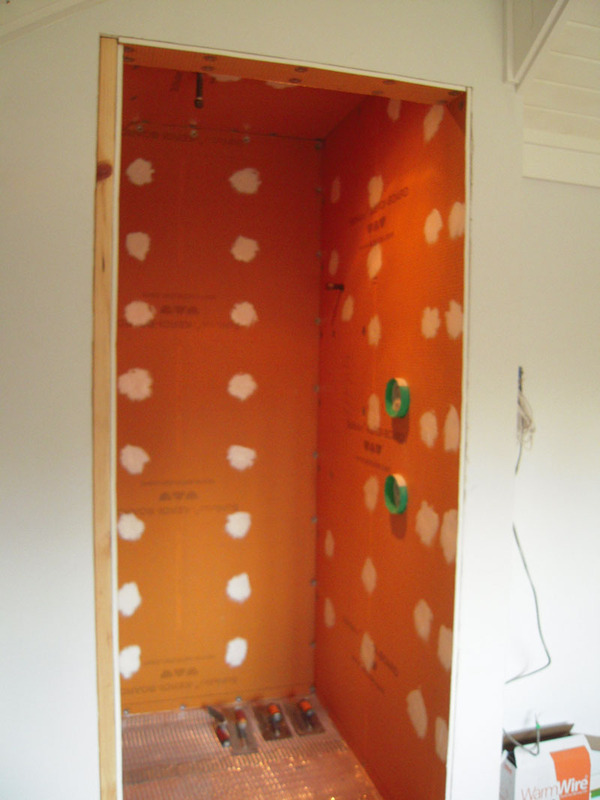 Ardex Liquid Backerboard. 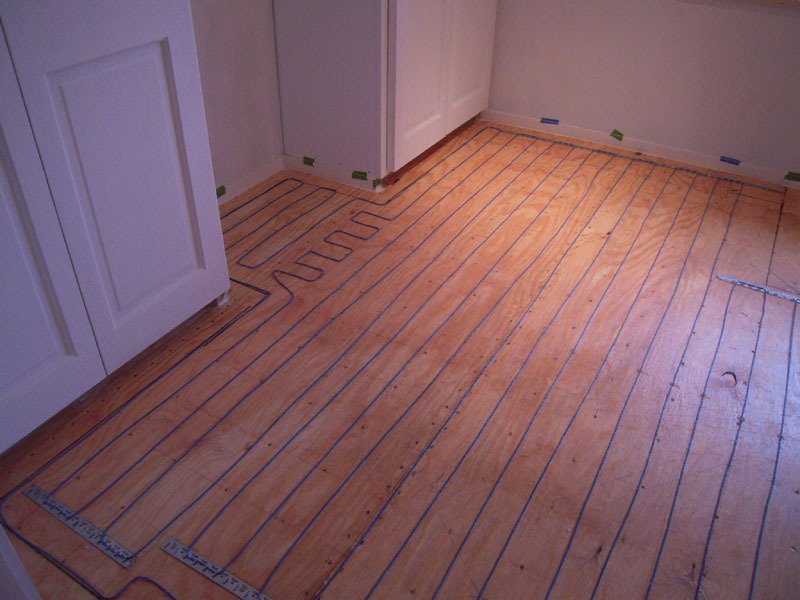 is poured over the subfloor and heating wires. 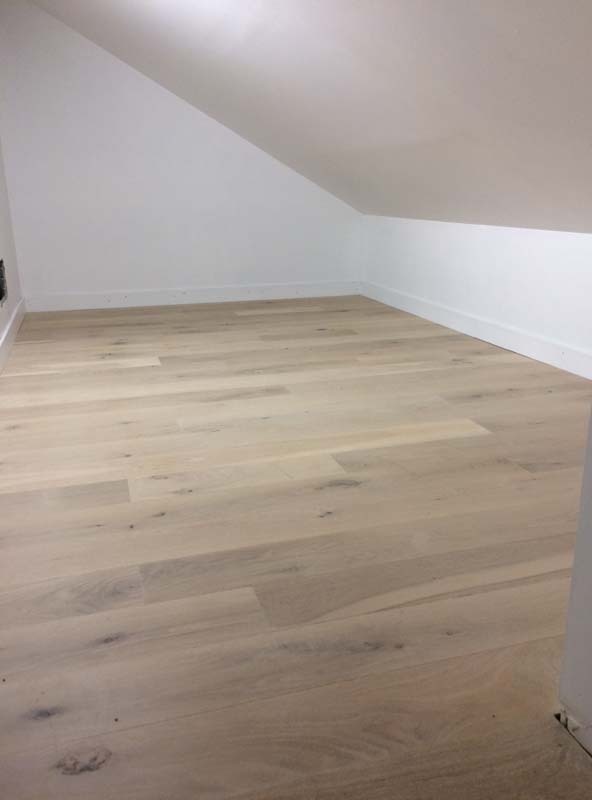 This floor was so wonky that it took 19 bags of this stuff. 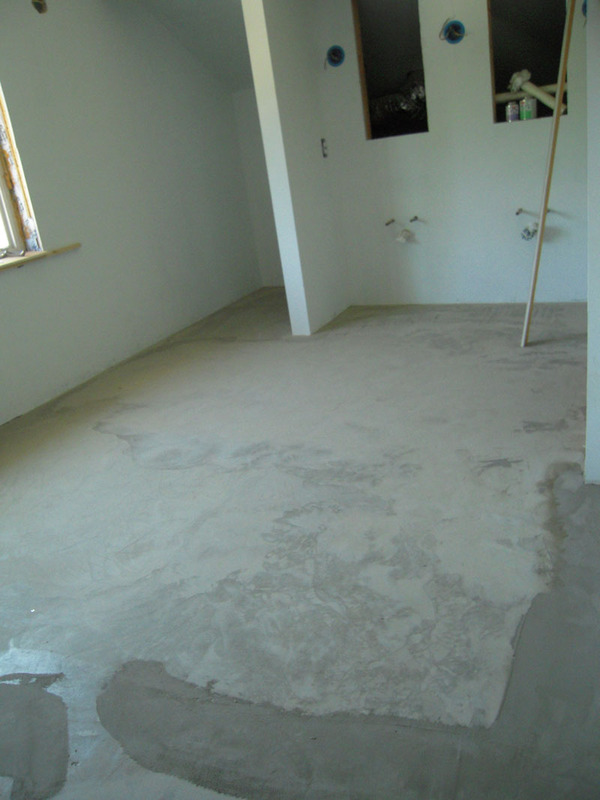 At about 50.00 a bag -it’s the price you pay to make an 80 year old house have a flat and level floor. 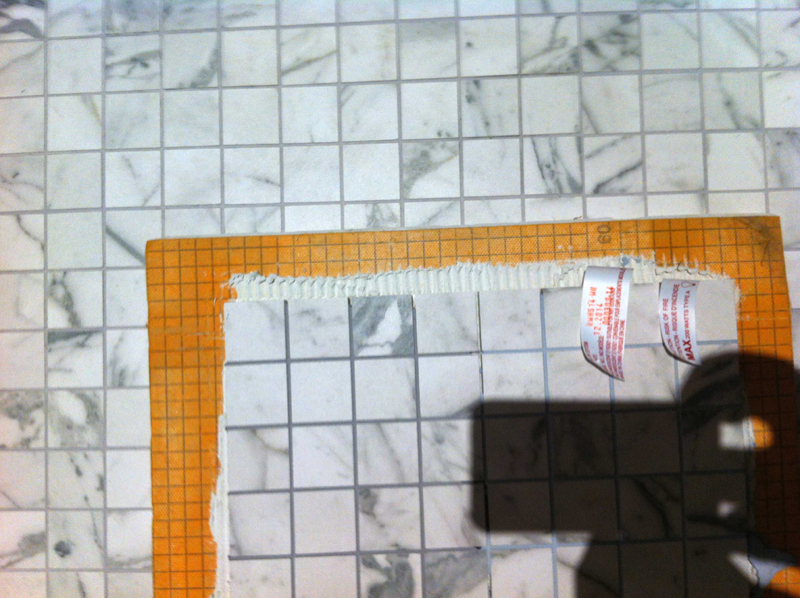 And it had to be flat for the basket weave tile to lay right. 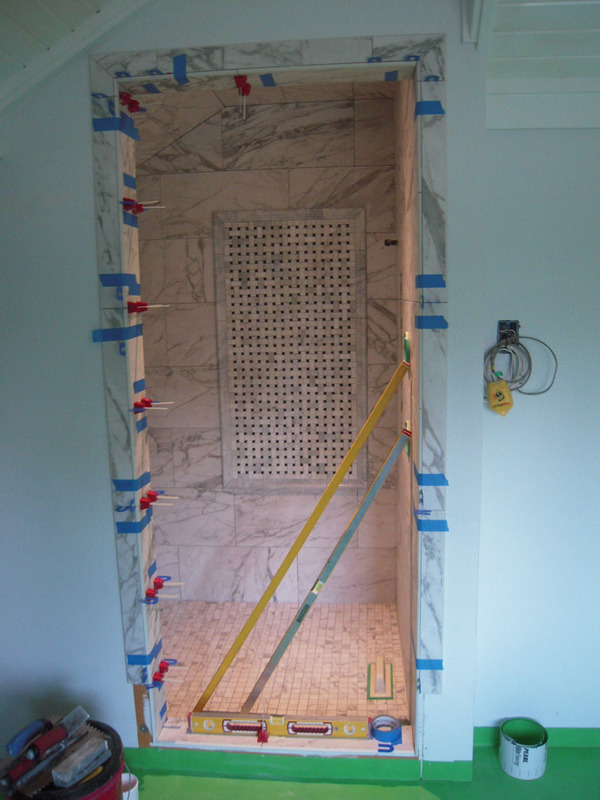 Here’s a shot of the back of the shower. It has lots of angles and a basket weave insert in the wall. 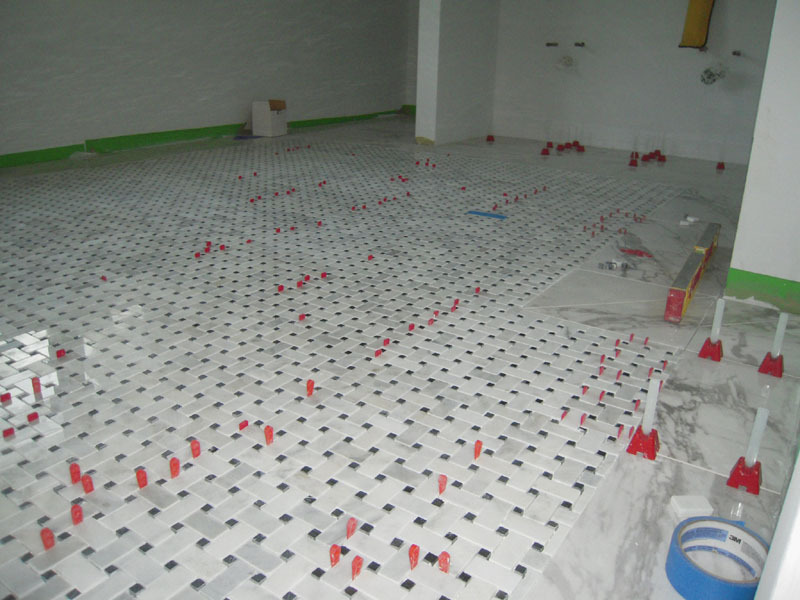 All the tile edges are bullnosed on site. Notice that they cut the tiles to wrap around the corner and keep the pattern. That’s why the pros are doing this job. 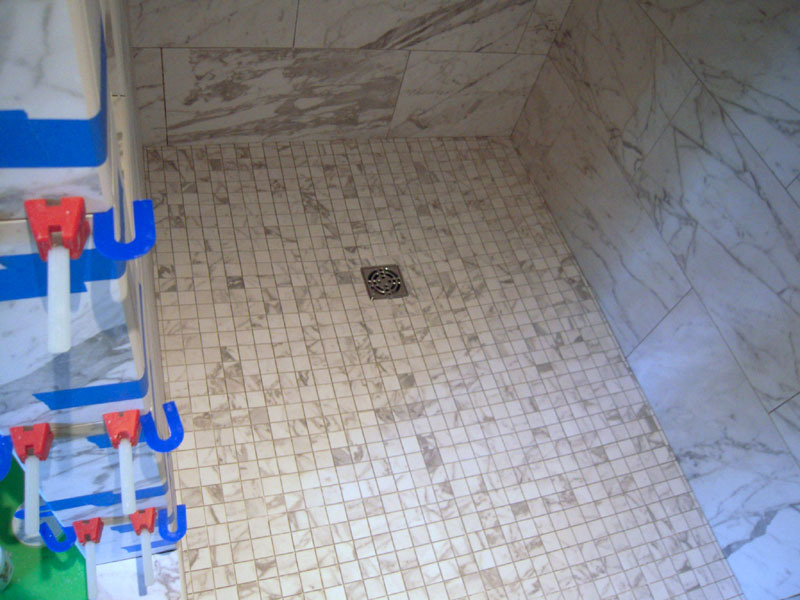 The basket weave insert in the shower is marble, but all the field tile and floor is porcelain. The two Hansgrohe I-Box rough boxes have 3/4″ water supplies. The top one controls the two rain shower heads and the bottom one is for the sliding shower bar. I put in two separate niches because my wife seems to have a dozen bottles of shampoo. This niche is next to the door, so you don’t see this from the outside. 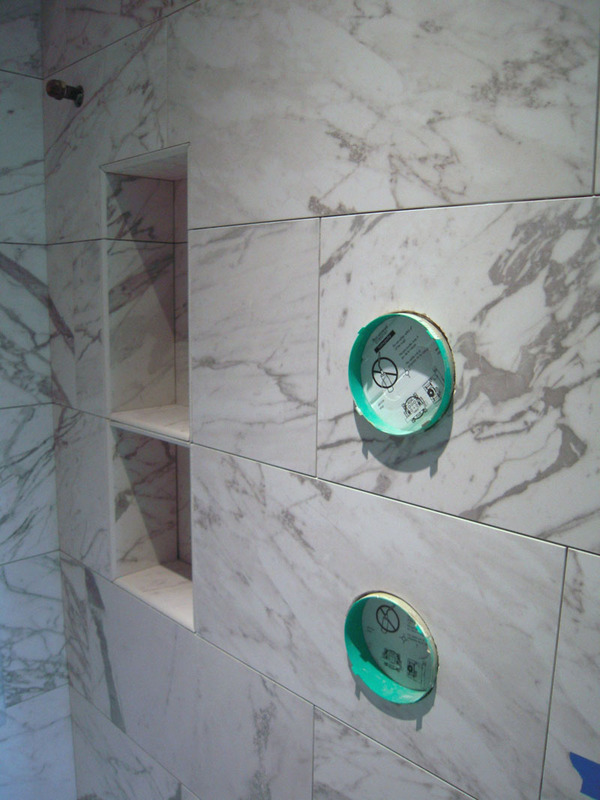 Can’t have too many niches – I guess. 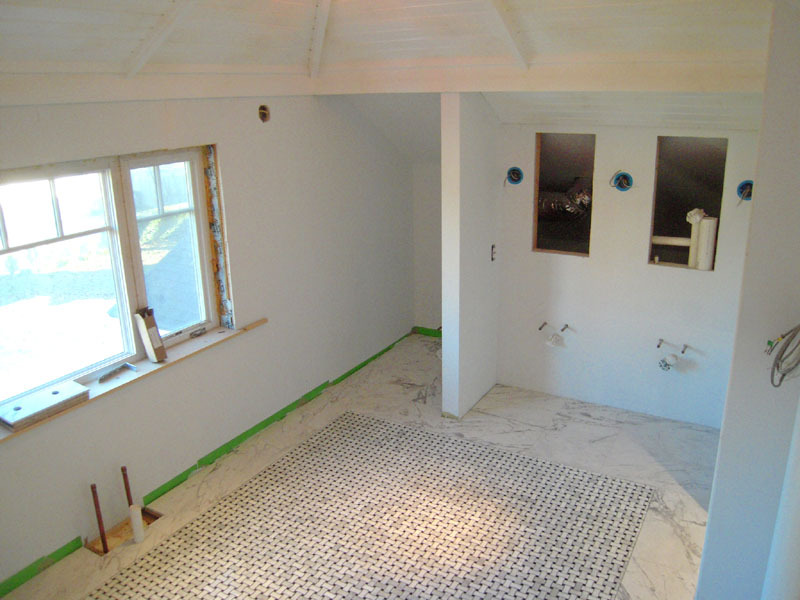 The shower floor is the same porcelain tile in a 2″ mosaic. 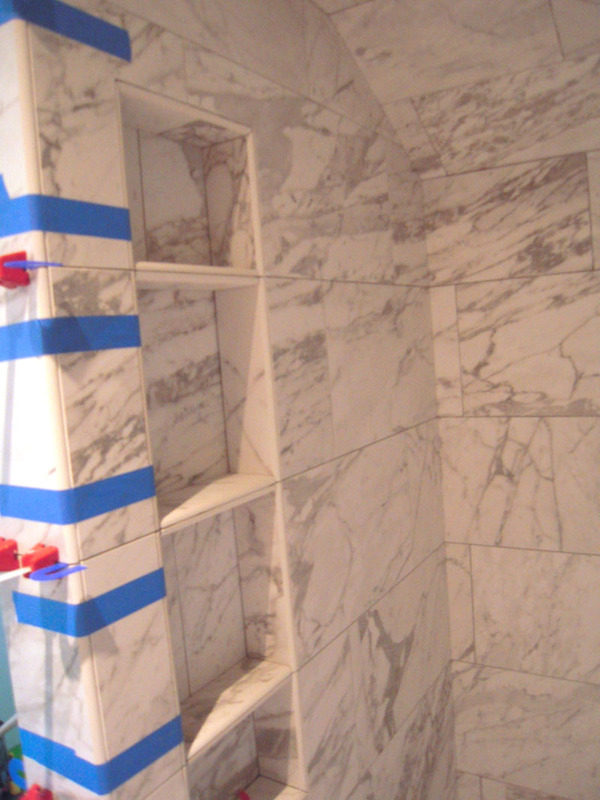 All tile in the shower is done in a matte finish to minimize water spots. 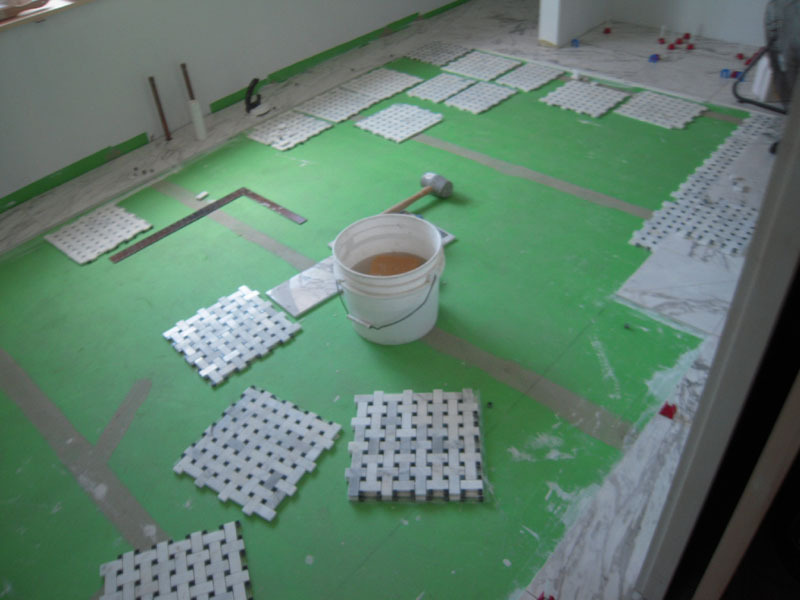 After the self leveling concrete a fracture membrane goes on. 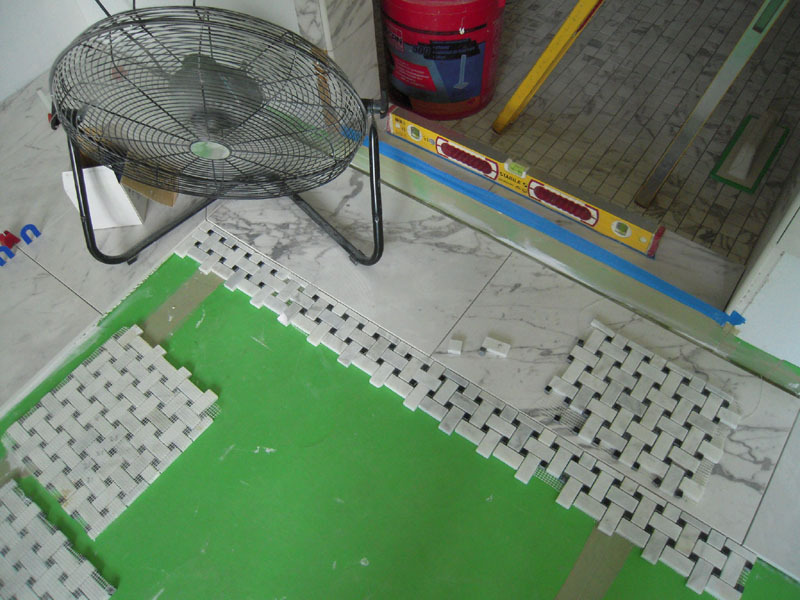 This is GreenSkin it’s used to minimize any fracturing or grout failure. It’ll add waterproofing too, as this is over the kitchen below. And the puzzle begins. 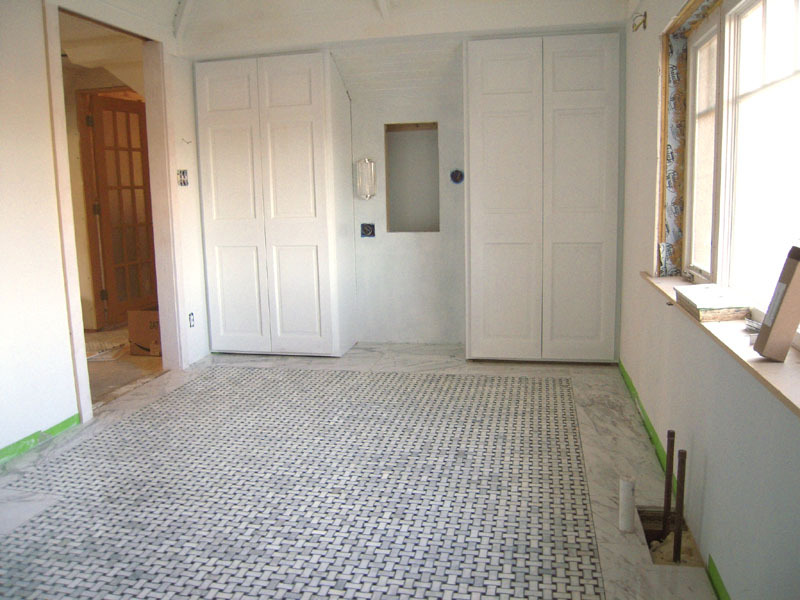 The border is a solid porcelain tile and the insert is a carrera marble basket weave. 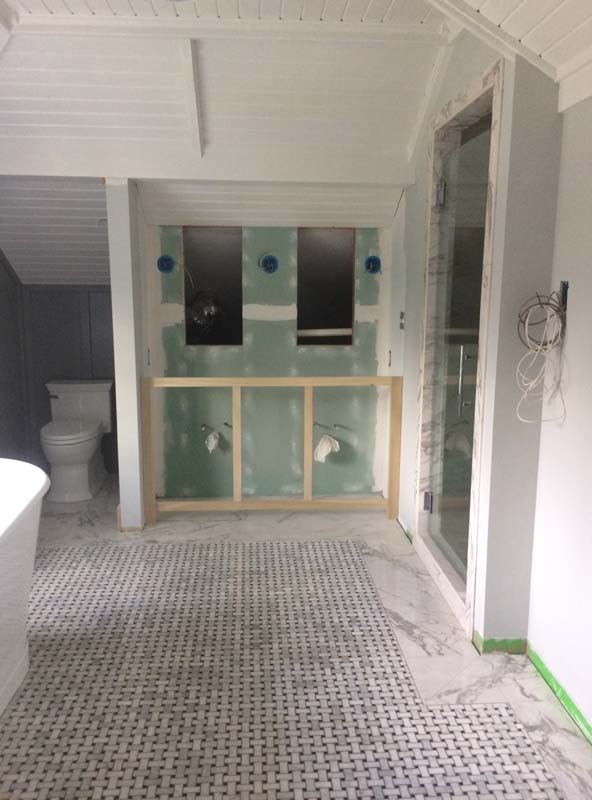 The bathroom is 9′ wide and 18′ long. 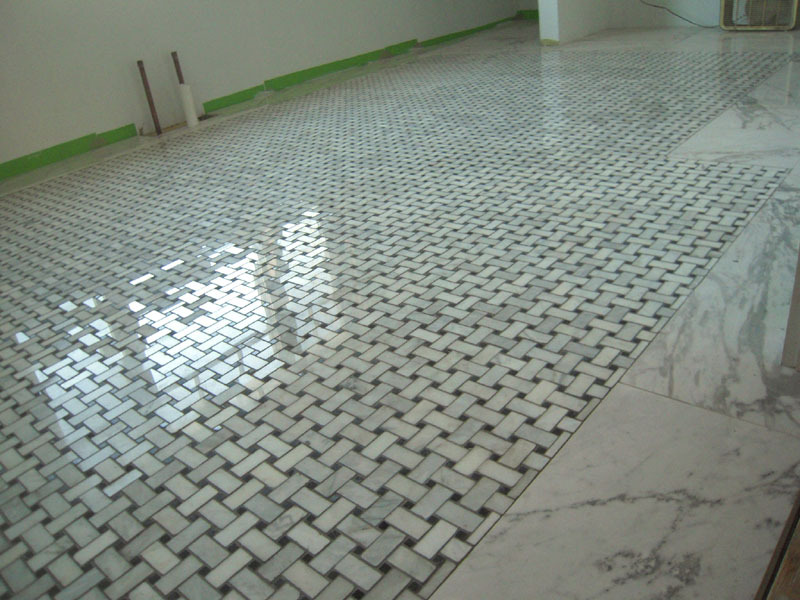 The tile is Atlas Concord Statuario Select 12″ X 24″ The inset is White and black Carrera marble mosaic basket weave. This is the vanity wall where my repurposed doors were made into cabinets. So on we go – so much to do and so little time. Hang in there, we’ll finish something inside someday.